Sween® Body Lotion is an excellent Skin Moisturizer for ostomy patients and medical workers. It offers a light, nonocclusive formula that allows pores to breathe while it moisturizes. Its special formula also makes it suitable for use with CHG products in the medical industry. It has been shown to allow 2% of CHG product to remain clinically effective on the hands. 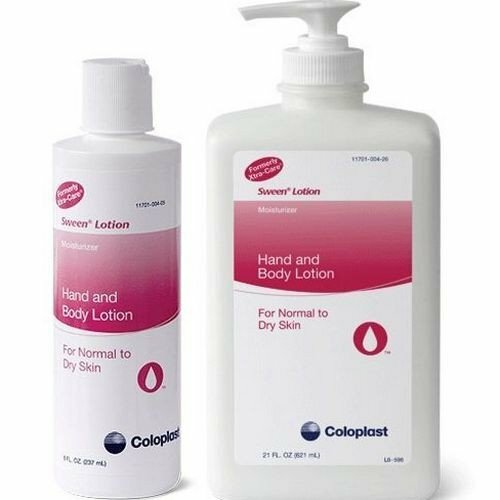 For ostomy patients, this Sween® Lotion from Coloplast works hard to heal and soothe dry, cracked skin around the ostomy area. It contains natural vitamin E and lanolin to promote healing and revitalization. Formerly called Coloplast Xtra Care Lotion, this product is also a great choice for anyone looking for an all-around hand and body moisturizer. It is used in hospitals and medical facilities across the country for its effective, non-greasy formula. Many people also recommend this lotion for use as a massage lubricant. Read additional features and specifications below. How can I order this fragrance free? The item already comes fragrance free. We do not offers samples to customers. If you're looking to receive one, it's best to contact the manufacturer. This item does come fragrance free. couldn't find in local stores, was easy to order and at check out I forgot to use a promo code, sent a request to have promo added to me ordered and a fast response was YES!! Got produces and gave as a birthday gift.